The year, 1997. Me, a freshly-pressed journalism graduate, itching to join the Indian print media. A dream that wouldn’t come to fruition. But I would get to scribble a few odd stories as a freelance writer. Ratnottama Sengupta, Times of India’s arts editor, would assign me stories on culture and literature–a “soft” beat I happily lapped up. One of those stories was on Sahitya Akademi’s translation awards. U.R. 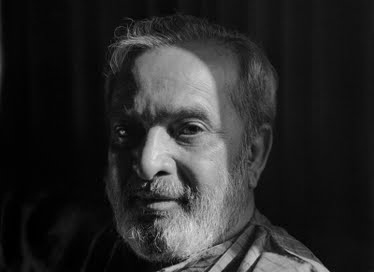 Ananthamurthy was the Akademi’s chairperson at that time. What follows next is as hazy as the darkness of that early (or was it late) winter evening that swept the outside once the award ceremony was over. But not without light following it. I don’t remember if it was part of my brief to interview him following the awards or if that was something I wanted to do. Nor do I remember how that interview was set up–did I ask him personally on the awards evening? Did I make a phone call to fix the appointment? All I remember is I got some time to speak to him the next morning–he invited me to join him for breakfast at IIC–the awards venue and also his place of stay in Delhi. As I sat across him at the breakfast table, URA had enlisted his latest admirer. Given his stature, his manner of speaking–soft, respectful, involved–moved me at once. A light breakfast fare–idlys, coconut chutney, small uttapams, diced papaya–lay in the small table between us. He insisted I have some, despite my polite resistance. Introductions and breakfast over, we moved to his room for the interview. I had no recorder with me so longhand note-taking would have to do. My knowledge of translations then was as limited as my knowledge of languages is now. As indicated above, my memory of our conversation is blurry. I do remember, however, the lambent beam of light streaming in through the window and the lush cover of green beyond it. When URA started speaking, his words seemed engulfed in a similar beam–gentle, yet radiant with insights and committed interest. I remember him lamenting the fact that a lot of translation of Indian language works have to happen through a link language like English or Hindi. He wished there were more direct translations–from Kannada to Bengali, Marathi to Kashmiri and so on. His eyes lit up when he shared his vision of a day when school-going children in one region would learn a language from another region. And I wondered why wasn’t this happening already? Why could I not learn Malayalam or Assamese in school? And even then I understood, this wouldn’t just be about learning a new language, but also about making friends with a new culture and its people, if only through the solitary medium of books. At the end of our conversation, I touched his feet (a mark of deference I extend with considered discretion). He smiled and said, “We need more bright people like you.Thank you so much.” Even though I didn’t believe that about myself, the warmth and sincerity of his tone, the genuine spark of hope in his eyes made those words credible to me. This is a touching and inspiring account of a meeting between two people dedicated to appreciating and enriching Indian culture. Thank you so much for sharing this Bhaswati. Thank you for this lovely comment, Joyce. It’s a blessing to come in contact with such a wonderful human being. Bhaswati: Even though I have never heard of U.R. Ananthamurthy, I enjoyed going through your piece. Besides, I love the way you write or rather your creative writing. I hope that you have started learning Urdu. You are bright, and I am sure you can pick it up fast. Mohsin, thank you so much, for taking the time to read and comment. I would love to learn Urdu, but have no one teach me! How I wish I could learn to read your beautiful language. Bhaswati: It is always a pleasure reading your prose and poetry. I can also send you some Urdu literature books from here once you get the hang of the language. So please don’t feel shy or hesitate in learning it. How kind of you, Mohsin. That sounds like a great idea. Now I need to find the time on Sundays. Will message you on FB for more. Thank you, again. I just read your piece on URA. I had the good fortune to be his student. That was more than 40 years ago, feels like it was yesterday, reading your post made it much more so. Anyone who had ever come in touch with him would feel personally bereaved by his passing away. I am very happy you had this opportunity to interview him and wrote about it. Thank you and may you do many more interviews of people similar to him. Thanks for your thoughtful comment, Srikanth. You really were fortunate to have been his student. And you are so right, anyone who came to know him would feel a sense of loss today.